Most of the discussion surrounding Kosaka and Xie (2013, Nature, doi:10.1038/nature12534) has focused on how much, according to their research, might natural variability have altered the recent global warming trend. But some of their results that haven’t received much attention might turn out to be the more interesting aspects of that paper. The attempt succeeded far better than expected — the match of model output to historical observations is uncanny. Nor can this be solely due to constraining SST in the el Niño region, since their chosen area of constraint is only 8.2% of the entire globe. 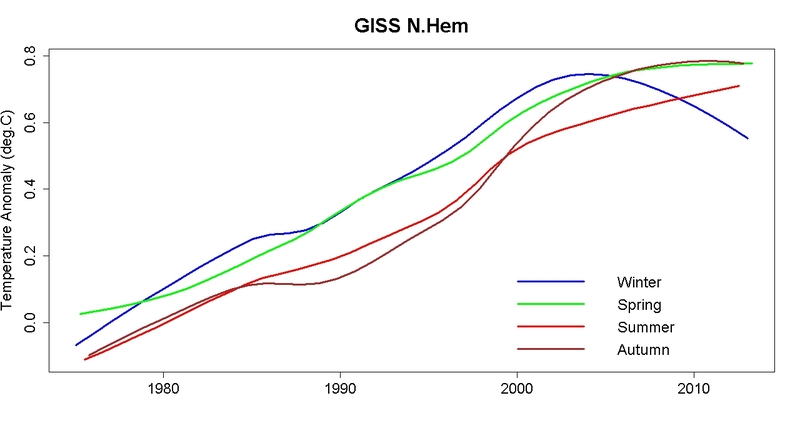 Their research strongly suggests that the GFDL model correctly simulates the impact of forcing agents (both man-made like greenhouse gases, and natural like volcanic explosions and solar variations) on earth’s climate, so that when it’s given the right el Niño process — the strongest known agent of natural internal variability — it can reproduce temperature history remarkably well. The principal result is that the reduced increase of global average surface air temperature (SAT) since about 2002 can be attributed to sea surface temperatures in the el Niño region. This has been posited often, and other evidence supports that view. But what I found most promising is that their constrained model does so well at reproducing not just global climate, but seasonal and regional patterns. The SAT hiatus is confined to the cold season13 (seasons refer to those for the Northern Hemisphere hereafter), with a decadal cooling trend for November to April, whereas the global temperature continues to rise during summer (Fig. 1c). POGA-H reproduces this seasonal cycle of the hiatus, albeit with a somewhat reduced amplitude. Although the La-Niña-like cooling trend in the tropical Pacific is similar in winter and in summer (Extended Data Fig. 4a), stationary/transient eddies, which are the dominant mechanism for meridional heat transport14, are stronger in winter than summer. As a result, the tropical cooling effect on the extratropics is most pronounced in winter (the seasonality of the temperature trend in the Southern Hemisphere extratropics is weak). The tropical influence on the Northern Hemisphere extratropics is weak during the summer, allowing the radiative forcing to continue the warming trend during the recent decade (Extended Data Fig. 4b). Kosaka and Xie go so far as to suggest that due to the northern hemisphere extratropics being so much less influenced by el Niño, continued warming from steadily increasing climate forcing has permitted extreme heat waves to develop over northern hemisphere continents this century (such as were seen in Europe in 2003 and Russia in 2010). This seasonal contrast is evident also in HIST. For 1970–2040, a period when the ensemble-mean global temperature shows a steady increase in HIST, the probability density function for the 11-year trend is similar in winter and in summer for tropical temperatures, with means both around 0.25°C (Extended Data Fig. 4c). The probability density function is much broader for winter than for summer forNorthern Hemisphere extratropical temperatures (Extended Data Fig. 4d). The chance of the 11-year temperature change falling below –0.3°C is 8% for winter but only 0.7% for summer in the Northern Hemisphere extratropics (around 4% in the tropics for both seasons). The 11-fold increase in the chance of an extratropical cooling in winter is partly because the tropical influence is stronger in winter than in summer. We examined regional climate change associated with the hiatus. Although models project a slowdown of the Walker circulation in global warming15, the Pacific Walker cell intensified during the past decade (Fig. 2c). POGA-H captures this circulation change, forced by the SST cooling across the tropical Pacific (Fig. 2d). As in interannual ENSO, the tropical Pacific cooling excites global teleconnections in December, January and February (DJF; the season is denoted by the first letters of the months). SST changes in POGA-H are in broad agreement with observations over the Indian, South Atlantic and Pacific oceans outside the restoring domain (Fig. 2a, b). The model reproduces the weakening of the Aleutian low as the response of the Pacific–North American pattern to tropical Pacific cooling11 (Fig. 2c, d). As a result, the SAT change over North America is well reproduced, including a pronounced cooling in the northwest of the continent. The model fails to simulate the SAT and sea-level presure (SLP) changes over Eurasia, suggesting that they are due to internal variability unrelated to tropical forcing (Extended Data Fig. 5a and c). Although the radiation-forced response will become increasingly important, deviations from the forced response are substantial at any given time, especially on regional scales19. We need quantitative tools — like our POGA-H — to determine the causes of regional climate anomalies17. The current hiatus illustrates the global influence of tropical Pacific SST, and a dependency of climate sensitivity on the spatial pattern of tropical ocean warming, which itself is uncertain in observations20 and among models21,22. This highlights the need to develop predictive pattern dynamics constrained by observations. It also points the way to other possibly fruitful research. 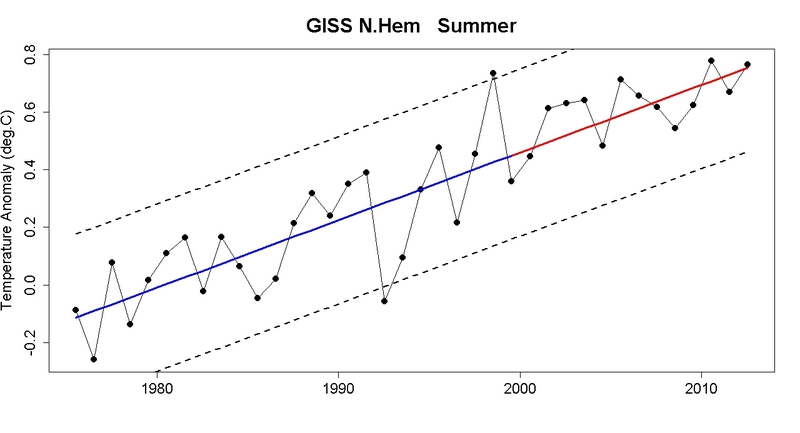 For instance, the regression approach of Foster & Rahmstorf, or simple energy balance models like this, might be improved substantively simply by allowing for a seasonal pattern in the influence of el Niño. 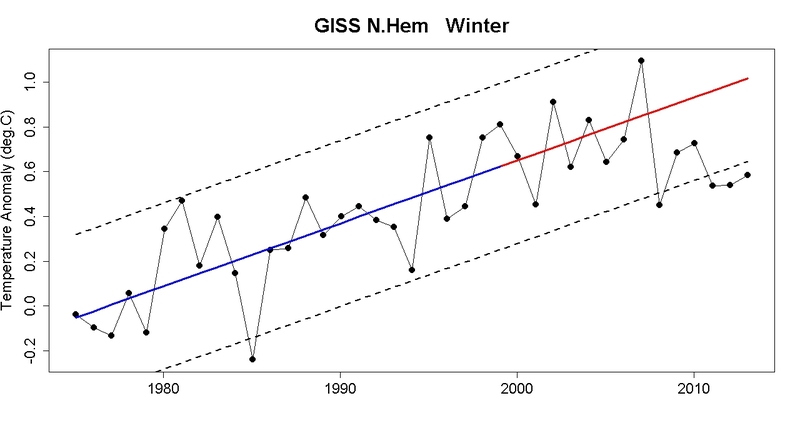 Internal variability over Eurasia in wintertime is quite large – you can deduce that from Fig. 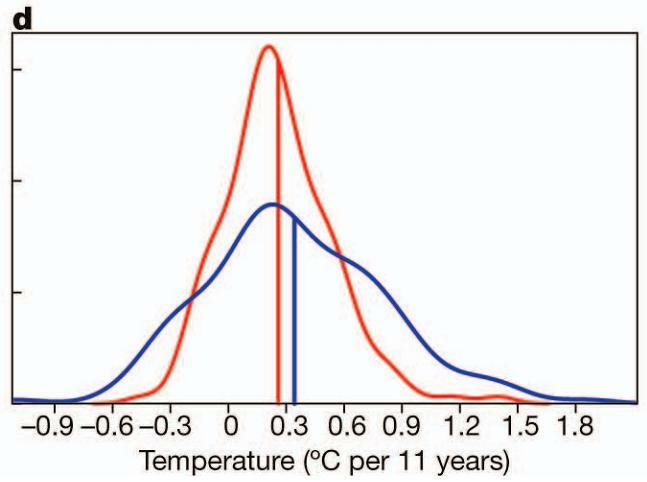 2b of Kosaka and Xie (2013), as the Eurasian temperature trend is strong but not statistically significant in the simulations. That example also illustrates that you really need more than 10 ensemble members to get the forced (ENSO-related and externally forced) regional trend patterns very well, although 10 members may be fine for the global average temperature. My guess is that if they increased the number of ensemble members, the simulated Eurasian temperature trends would tend to zero. Because wintertime Eurasian temperatures are closely linked with the AO/NAO, which is characterized by high internal variability unrelated to SSTs, it’s tough to tease out any signal in short-term trends. Still, it’s interesting that the observed SLP trend is so strong over that region, and the ideas of Judah Cohen regarding AO variability/predictability are intriguing. Have you come across Cohen et al. (2012) Asymmetric seasonal temperature trends? Very interesting in this context. Thanks for a fascinating post. Tamino —- Errat in second paragraph: the Pacfic Warm Pool is the tropical *western* Pacific Ocean. Very exciting. Improvement in regional predictions would be good. This was a very clever experiment, which will hopefully enhance our understanding. Sorry this is off topic, but the relevant thread is closed. I was curious what your response is to Tisdale’s claim that your linear model in “Fake Predictions for Fake Skeptics” only works because you leave off the last year from your linear fit? If Tisdale absolutely didn´t get it that shifting the trend line upwards in his original post was not a valid thing to do, he´s certainly not going to get the fact that if one year of data makes a huge difference to your trend line, then you are cherry picking/looking at too short a time frame. None of the commenters over at WUWT (with the exeption of Lazy Teenager) seem to get that either. Quelle surprise. Sorry Mssr, Provocateur, but is Tisdale the same as discussed here: http://wottsupwiththatblog.wordpress.com/2013/07/25/watt-about-the-ukmo-report-part-1/ ? Say no more. The take-away point with Tisdale is that he is operating far beyond his abilities. The URL of the link you provide should indicate that Tisdale is taking a second bite at this particular cherry. Give his first attempt at sorting out his errors stretched to 6,000 arse-covering words (and even included a 600 word summary) you have to ask why a second attempt is required. The whole thing could have been sorted in less than 60 words had Tisdale the wit to understand his own ‘work’ and report honestly about it. This “Part Two” you ask about – I always enjoy a good laugh so I gave it a quick read. And hey, Tisdale manage to say his piece in only 1,400 words!! Yet Tisdale again fails to grasp the situation. The four substantive points he presents (I should say “presented” because this is all from January 2012) shows plainly he doesn’t understand what he is trying to say. The one you mention is but another example of cherry-picking and not entirely relevant to the issue at hand. Tisdale isn’t helped by his reluctance to present his original mistakes. So attempting to explain how he was right all along and everybody else was wrong isn’t as straightforward as it could be for him. As an aside, I enjoy Tamino’s writing a lot and would like to include some of his cartographic images in my zine at some point. Keep up the good work! I don’t think that the Cohen noted Eurasian Boreal cooling represents work that Kosaka and Xie need to address. Cohen posits (correctly IMO) that the Eurasian Boreal cooling is due to autumn snowline advance (in turn related to summer sea ice recession), an exogenous factor in terms of Koasaka and Xie. I can give myself a slight pat on the back that I did notice the seasonal difference some months ago. I even put up this chart on another blog. 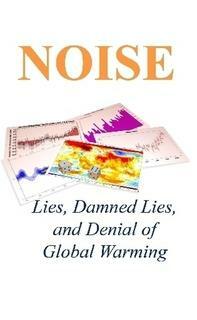 it is quite exciting to be even on the far distant fringe of a real advance in climate research. Should this same trick not be tried with more ocean temperatures? Including the bits near melting ice. How much of our uncertainties are due to these ocean-related difficulties? I’ve done some playing in the past with the seasonal signal of ENSO on temperatures. It is most obvious in UAH data, and my approach was to group La Nina and El Nino events together, adjust the global temperature to a common baseline by detrending to cancel out an assumed 0.18 deg/decade warming trend, and plot the temperature for each month (eg all Jans, all Febs etc). Most ENSO events result in a reasonably consistent impact on temperature, with 1998 and 2008 standing out as being much more severe than typical. The typical pattern is that global temps only start to respond around December, but spikes rapidly to peak in January, to slowly fade up until about August or September. So NH Autumn is the period during which ENSO influence on temps appears to be minimal. This reflects your 10 year smoothed trends by season where the Autumn trend is still upwards at a similar rate to the 30 year trend. The hemisperical monthly temperatures perhaps show other interesting features. (It was a particularly wet and grey afternoon so I produced a colourful graph to illustrate the second two points.) To smooth the data, I took the simple recourse to use 5-year rolling averages. ☻As described in the post, in the NH, the recent ‘hiatus’ is a winter phenomenon. Particularly, December-February all show downturns in temperatures with April-August all showing a continued rise. Over this same short period, down in the SH the monthly trends are more cat’s cradle than any distinct trend. ☻Over the full 1880-2012 record in both hemispheres, the October-March temperatures have risen more than April-September temperatures (Linear regressions 1905-2012 NH 15% more, SH 13% more). ☻Similarly, it is the October-March monthly temperatures in both hemispheres that exhibit the greatest inter-month variation. (On the linked graphic, shown by the blue winter month in the NH & the pink summer months in the SH.) Again ignoring 1880-1904 as the graph gets a little wild back then, the average spread of the half year monthly temperatures for 1905-2012 were for NH O-M 0.278ºC, A-S 0.134ºC & for SH O-M 0.245ºC, A-S 0.156ºC. The NH months May-September show particular conformity averaging 0.100ºC spread. Perhaps another observation from the graphic is that there are no symptoms to suggest any 60-year natural cycle acting on these temperatures. This was my reason for taking a look as I hope to shortly renew my little game of “Where’s AMO?” with those who propose that such a cycle does waggle the global temperatures at that frequency. The southernmost ice core from Greenland was analyzed for dominant frequencies for the past several hundred years. The result is that only a 20 year quasiperiod rose out of the noise. There ain’t no persistent AMO. I think I would disagree, but perhaps only in definition. There is evidence of a 60-year AMO, just as there is evidence of a 20-year AMO. The problem which folk like Zhou & Tung seem to consciously dodge & which Wu et al address (fig 9.) but without any regard to what they are analysing is perhaps illustrated by the CET record. If there was a 60-year-type cycle waggling 20th century temperatures to any significant degree (as the deniers would love that there were), why does it fail to significantly waggle the CET over the previous 250 years? AMO is not a feature of pre-1900 CET yet CET is the temperature record for an island stuck right in the side of the ocean in question. How then does AMO appear globally without leaving its mark on the CET? So I conclude, if there is evidence of a 60-year AMO (and I suggest there is), the evidence of it being a significant feature in global temperatures remains entirely lacking. So is this seasonal polar amplification, mostly? Does humidity (water as a greenhouse gas) decrease in wintertime enough that a trend due to CO2 increase would be more detectable in winter? I am an editor of a new Polish site on climate change and climate research http://www.naukaoklimacie.pl, taking example from Skeptical Science etc. Can we use (and translate) one of your plots from “el Niño and the Non-Spherical Cow” in our text about Kosaka and Xie experiment?